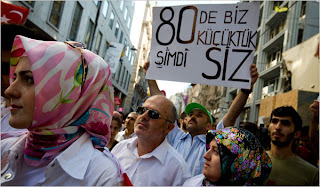 In response to the AKP closure case earlier this year, numerous democracy groups protested across the country against what many Turks viewed as another postmodern coup. This photograph captured a protest held this past June. The protest sign pictured reads: "We Were Small in the 80s. Now You Are." The number of young people active in politics is very low in Turkey, despite its high youth population, but a group of university students plan to voice their demands prior to local elections in March. Upon founding an association, the students have started to lobby municipalities firstly for cheaper transport fares. For a country of young people the average age of politicians is very high and this is reflected in government priorities that ignore the needs of the youth, said a group of university students who have decided to take action. A group of Istanbul students have formed a pressure group to lobby municipalities prior to local elections in March. The group wants their needs to be taken into account by municipalities and will start lobbying different candidates. For this purpose, students have founded an association, "Youth Movement" (Gençlik Akımı), to voice their demands, which they believe have been neglected by mayors for too long. "We plan to prepare a petition that will include our specific demands, such as cheaper transport tickets for students," said Adnan Alkış, head of the association. Alkış believes if they can show candidates that university students represent a significant number of voters, they can improve conditions of life for students. "We expect to get 100,000 signatures from students and this means 100,000 votes for the candidates. They must take our demands into account, too," said Alkış, a senior student from Sabancı University. Coming from different ethnic, socioeconomic and even ideological backgrounds, eight students founded the association last April, an endeavor that sometimes required courage, dedication and enthusiasm considering the red tape involved in founding an association in Turkey. "We all come from different backgrounds, but our common thread is our social sensitivity," said Bulut Çavaş, a student from Sabancı University. Although the students are offering to deal with all types of social problems, they have emphasized they are not part of any political party or movement. Sociologists often talk of how the 1980 military coup led to apolitical generations as youngsters were discouraged from even being interested in politics, let alone taking an active part in it. Their fear about being labeled as part of an ideology is rooted in the highly tense period prior to the coup and the main reason Turkish youth have been largely apolitical for the past 30 years. "After the coup in 1980, youth were punished for activism. Parents advised their children not to be a member of a party or a political movement. This discouraged young people and led to disorganization among them," said Mustafa Şen, a sociologist from the Middle East Technical University in Ankara. Şen also said the main reason why young people do not participate in politics, despite their numbers in Turkey, relates to the laws on political parties. The non-institutional structure of political parties discourages youngsters, as does the education system and their families. "In Europe, you can start to work in a political party from the bottom and reach the top at an earlier age than in Turkey. However, our parties do not have such an institutional structure," said Şen, who added the difference between the European Union’s and Turkey’s political structure will cause problems in Turkey’s candidacy period. "The generations that preceded us left a very bad legacy. We face difficulties in finding more people who can work with us as everyone believes we are part of a political party," said Halil İbrahim Özcan, a senior student in Yıldız Technical University. Even with such reluctance from students, the association already has 33 members. "According to a recent law on political parties and elections, youth branches of political parties are banned. No political party in Turkey has youth support and politicians do not care about it," said Şen. The majority sometimes regards being part of an ideological and political group as dangerous. The founders of the Youth Movement feel the pressure of being labeled as a part of political group and hesitate to give political views in general or their own personal views about mayoral candidates. "We do not want to be labeled as this or that. We want to work for the good of the people," said Özcan, 23. One of the most salient points made in this article is these youth groups' democratic vision just a few decades after the crushing coup of 1980. In so many ways, Turkey's political dysfunctions can be attributed to the heavy-handed authoritarianism of the military rule that bore down on the country in these post-coup years. Indeed, an understanding of the 1980 coup plays prominently in the historical memory of many of these young reformers (see, for example, the Young Civilians). Although Turkey made a democratic recovery under the inspiring leadership of Turgut Özal, grassroots democracy is still very much incipient and political parties remain heavily top-down structures. Politics in Turkey too often seems a spectator sport left to politicians who make it to the top of the country's party apparatus, and rather than hold politicians feet to the fire on policy positions citizens dislike, political participation too often manifests itself solely at the ballot box in the form of casting votes for parties that -- outside of elections -- are indifferent to calls from grassroots reformers and unresponsive to political demands from below. Some of the problem is indeed that political participation is embraced merely as a matter of elections, but political parties too bear a share of the blame. Turkey is in need of vibrant political leaders inside and outside of party leadership who are genuinely committed to civil society development and the construction of more responsive institutions. The importance of the youth movements highlighted in this article is that they move politics outside the realm of elite political gamesmanship and into a more vibrant and participatory public sphere. If Turkey's youth more actively engages the country's politics, the country's democracy is more likely to flourish in the future -- the coup of 1980 left behind in the annals of history as a painful memory of a time when politics was substituted for coercion. For an earlier look at youth in politics by the European Stability Initiative, click here. The study is in collaboration with the ARI movement, a leading pro-democracy NGO concerned with youth politics, and pays particular attention to Turkish youth and the European Union.